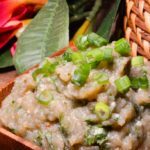 Laotian eggplant dip called jaew mak keus is delicious. 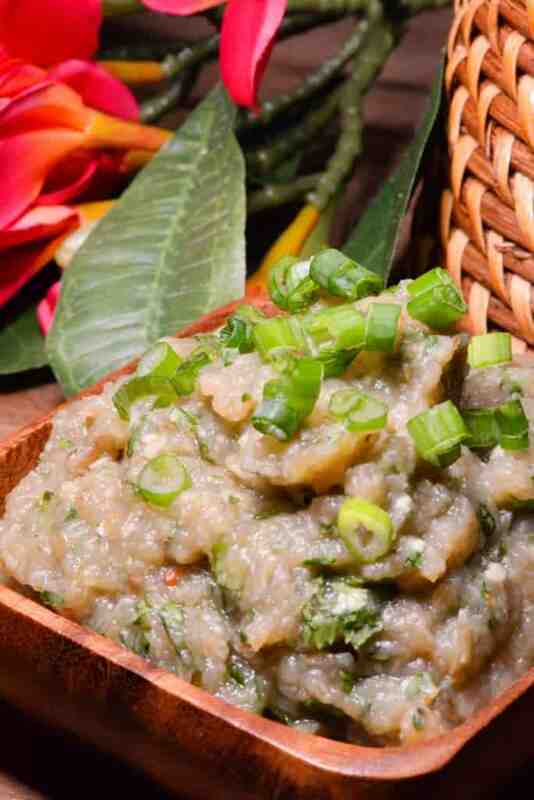 Dips are very popular in Laos as sticky rice is the base of every meal. Dips to put your sticky rice in are loved and this jaew (that means dip), is no exception. Made with roasted eggplant, garlic, shallot and of course chili give it a unique smokiness to the dip. Enjoy! Spicy, smoky goodness, you will love this Lao dip! Note you can use a food processor if you don't have a good mortar and pestle. However that is the way they make in Laos. Add fish sauce to taste and the green onion to garnish. Serve with sticky rice or crackers.